The OnePlus 6T is a slightly more advanced variant of the OnePlus 6. The device has face unlock and also an under-display fingerprint sensor it has 6.41-inch Optic AMOLED display is the largest ever in a OnePlus phone. This packs in the 2,solution, 402 pixels per inch and has the tall 19.5:9 aspect ratio. It is powered by an octa-core Snapdragon 845 SoC paired with upto 8GB of RAM and comes with 256GB of onboard storage space. Backed by a 3,700mAh battery. OnePlus 6T has 16-megapixel primary rear camera with f/1.7 aperture, 1/2.6″ Sony IMX519 sensor, dual LED Flash, 1.22μm pixel size, OIS, EIS and a secondary 20-megapixel camera with Sony IMX376K sensor, 1.0μm pixel size, f/1.7 aperture, 480 fps slo-mo at 720p, 240 fps at 1080p and 4k at 60 fps. At the front, there is a 16-megapixel camera with Sony IMX 371 sensor, 1.0μm pixel size and f/2.0 aperture. 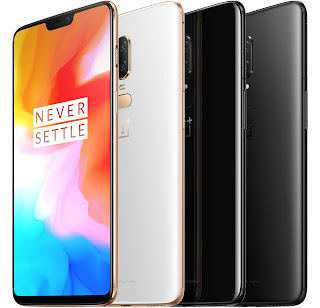 Performance-wise, not much has changed over the OnePlus 6, however, the OnePlus 6T has also become the first smartphone from the Chinese smartphone maker to ditch the 3.5 mm audio jack. This step has been taken in order to implement the in-display fingerprint scanner technology as well as a bigger battery size. On the software front, the smartphone runs the bloatware-free proprietary Oxygen OS wrapped under Android 9.0 Pie.